EDMONTON — Oilsands activity has uncovered vast wealth of a different kind — a 10,000-year-old quarry rich with tools and weapons including a pristine spearpoint still smeared with the blood of a woolly mammoth. "It's got this echo of the Ice Age world," said Jack Ives, Alberta's provincial archaeologist, who described the find in a hearing before the province's energy regulator today. "There's quite a rich concentration of artifacts." The so-called Quarry of the Ancestors, which scientists suspect may be one of first places where humans put down roots in northern Alberta after the retreat of the glaciers, is found on an outcrop of hard, fine-grained sandstone adjacent to the Albian Sands oilsands lease about 75 kilometres north of Fort McMurray. The $12.8-billion Albian Sands project is currently before the province's Energy and Utilities Board. The quarry was discovered in 2003 when Birch Mountain Resources, which quarries limestone in the area to make chemicals used in oilsands mining, conducted a routine archaeological survey prior to its own proposed expansion. The site's importance was evident almost immediately, said Nancy Saxberg, who conducted the field work. "We went into the woods and dug a couple of holes, and everywhere we dug a hole we found archaeological material," she said. Spearpoints, knives, scrapers, stone flakes and tiny micro-blades that would have been fastened to a wood or bone handle all began to emerge from the boreal loam. "People were prying this stuff out of the ground in chunks," said Saxberg. One investigator turned up a spearpoint still sharp enough to penetrate flesh. When tested, it contained traces of proteins that matched elephant blood. 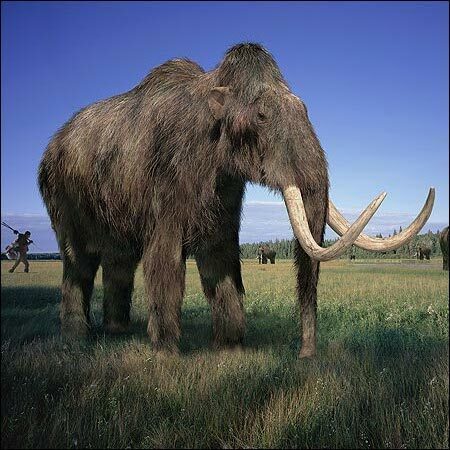 The only possible source would have been a mammoth, an animal thought to have died out more than 10,000 years ago. "It was pretty thrilling," Saxberg said. The site, spread out over a square kilometre, was so large that Saxberg said the normal archaeological practice of establishing the boundaries of a site had to be modified. "We couldn't define the sector because the sector was so freaking huge." As well as offering beautifully preserved examples of fine ancient craftsmanship, the Quarry of the Ancestors will provide vital clues to North America's human history. The soil at the site is unusually deep for the area, said Ives, allowing archaeologists to separate material from different time periods. "There appear to be opportunities to learn more about chronology," he said. As well, tools fashioned from rock known as Beaver River Sandstone have turned up at hundreds of sites in northern Alberta and Saskatchewan. The source of that stone has long been mysterious — until now. It came from the Quarry of the Ancestors. "There's a vast area in which this raw stone material was circulating," Ives said. Ives has assembled what he believes to be the outline of the area's history. People first started coming into the area about 12,000 years ago, as the glaciers gradually retreated north into what is now the Northwest Territories. People followed their retreat, passing through the quarry area as part of their nomadic rounds, stocking up on the excellent stone and hunting when game presented itself. Human occupation was interrupted about 10,000 years ago when a massive flood from Glacial Lake Agassiz inundated the area. People returned as the floodwaters abated, this time sticking around instead of just passing through. The quarry was a centre of occupation for thousands of years. The depth of that history has thrilled members of the Fort MacKay First Nation, on whose traditional land the quarry sits. "The community, especially the elders, found it to be very important to them," said Lisa Schaldemose of the Fort MacKay band. Although band members are cautious about claiming the quarry's ancient toolmakers as ancestors, artifacts are on display at the band office and community gatherings have been held on the site. In an area where land access is increasingly complicated by oilsands leases, Schaldemose says Fort MacKay wants the quarry to be permanently available to its community for use as a gathering place. Everyone agrees the quarry, which is surrounded by oilsands leases, should be preserved. Birch Hills Resources, which owns the quarry rights, has chosen to expand elsewhere, said owner Don Dabbs. "We recognized the importance right off the top," he said. ``This area has had a very long history of being important to people." TransCanada PipeLines has rerouted one of its lines to avoid the site. Shell Canada has altered plans to put an overburden pile in the area. Ives's department is asking Community Development Minister Denis Ducharme to declare the site a provincial historic resource, which would preserve it. The Quarry of the Ancestors is irreplaceable, said Saxberg. "This is an example of an early, early time when people are staying in one place and getting to know the landscape and getting to know the resources that are there," she said. "It's part of the beginning where people are starting to identify with specific places. It's a really important time in the history of North America where people are figuring out where they belong."